WRX back road bomber build: the final update. I can’t believe its finally done. Big brake kit, downpipe, intake, new speakers, and 4 new bearings. The turbo sounds like a jet engine and every downshift/WOT pull involves a healthy crack and pop. 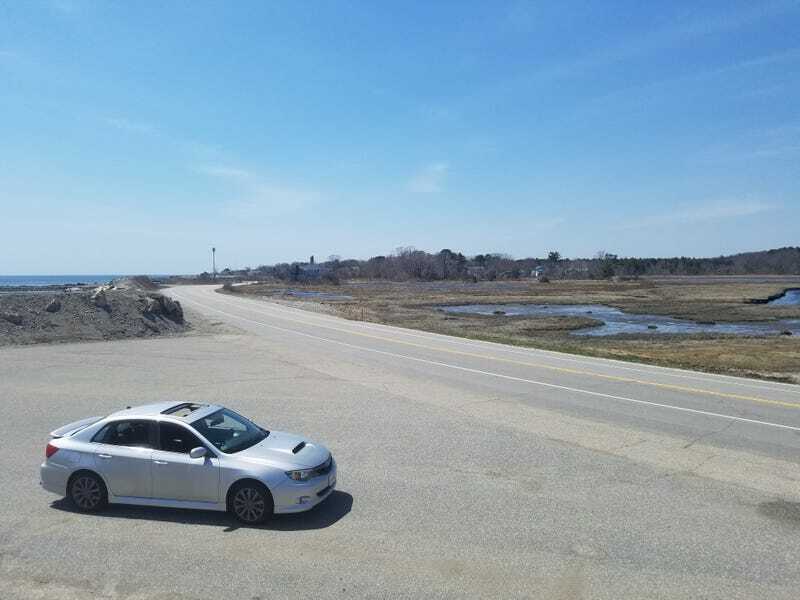 This morning’s drive up the coast to Portsmouth NH was a fun cruise. It’s the first 80 degree day of the season, so the Hampton beach scene was out of control. I never went faster than 40 MPH but that’s alright. All the enthusiasts are out in their Summer cars, lots of C7 Vettes, Porsches, and even a Mclaren 12C. Great vibes. The brakes feel fantastic. Confidence inspiring steel lines tightened up the brake feel and of course the 2 pot/4 pot setup is an infinite improvement over the intentionally cheap and inadequate OEM 1 pot/2 pot calipers. This is the classic “big red” kit from an 07-08 WRX that gets slapped on everything from little rice rockets like mine to brand new FR-S track builds. The ECU is running a 93 octane stage 2+ tune which bumps the power up to approximately 310HP/300TQ which is quite a lot in a 3100 LB car! Your average 300HP 2018 model weighs 3500 or even 4000 LBS. It’s too hot for windows down driving but when it cools off later this week I’ll be up in the white mountains for a real test of those brakes on the fun passes/narrow roads that just opened up this month. That’ll be a great opportunity to test out the new dash cam/external mic (iphone earbuds lmao) in the trunk. The cord runs through to the center armrest in the back seat and the idea is that I’ll combine exhaust audio from the trunk and turbo noises from the garmin cam’s mic. Should be fun.